Golda Schultz as Clara (above), William Burden as George Bailey (below). Photo by Cory Weaver. Some entertainment classics etch such a profound image in our memories that an alternate interpretation is almost unthinkable. Frank Capra’s holiday movie favorite It’s a Wonderful Life is such an American treasure. That notwithstanding, composer Jake Heggie and librettist Gene Scheer have taken on the task of transliterating the beloved work from film to opera. And while the spatial limitations of the stage compared to the world of film result in a trimmed narrative, the concept holds up well and yields a rewarding outcome. It’s a Wonderful Life is a quintessential American opera in its language, its content, its social perspective. Composer Jake Heggie has never been intimidated by cutting-edge contemporary opera standards and has created work that unapologetically draws on past musical forms with warmth, emotion, and melody. Indeed, his music connects more with Bernstein, Gershwin, and Sondheim in their dabblings at the periphery of opera, and like their masterpieces, he has produced a tweener that in some ways is much like a Broadway musical. His diversions from traditional grand opera include strains of Christmas and pop music as well as spoken dialogue. A rousing, made-up ’20s dance coined the Mekee-Mekee recurs throughout with lively hand clapping, high stepping, and foot stomping perhaps never seen or heard on the opera stage before. Most of us remember the broad strokes of the plot from the movie, so spoilers shouldn’t be an issue. The aspirational George Bailey is repeatedly held back from achieving his dreams by making good on the failures of others. In supporting his brother Harry, he never gets to go to college or seek work in the big city or visit the Parthenon and the Colosseum. Stuck in Bedford Falls, he struggles to keep the wolf from the door of the Building and Loan. Although the business has entrapped him, he must keep it alive to provide housing opportunities for the community that would otherwise be subjected to the evil Mr. Potter’s financial machinations. In his despair, he decides to end his life, at which time his guardian angel appears. Gene Sheer was tasked with creating a libretto that would capture the spirit of the movie, and overall, he has succeeded. However, much of Act 1 is slow, and key events in Act 2 whiz by. For those who know the story, we get it, but for the uninitiated, there may be insufficient time for some incidents to be appreciated and absorbed. To compensate for the restrictions of staging and catering to the musical score which dominates the creative process in opera, the librettist and composer have come up with a number of designs and devices that add tremendous spirit to the opera. The design elements in this production are brilliant across the board, led by Robert Brill’s set design and Elaine J. McCarthy’s projections. It is simply too hard to describe the effect succinctly. Though the lead photo in this review gives a snapshot idea, there are many moving images evoking a starry night and a panorama of sights. Choreography and costumes add depth to the experience. 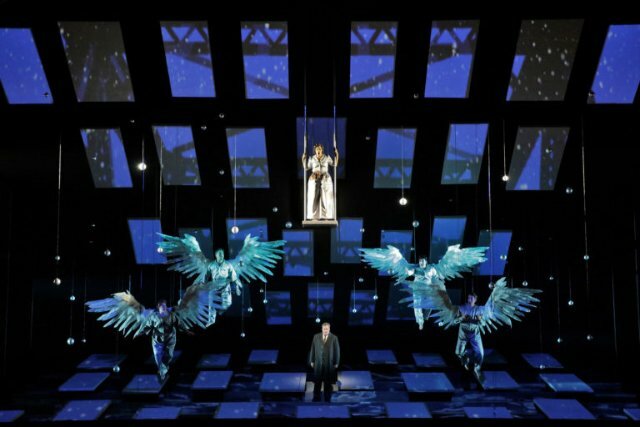 The photo pales compared to the real staging, where the numerous panels host many projected images over the course of the opera, but most importantly, they represent attic doors to days in George’s life. The ones on the floor open like root cellars on farms, from which players sometimes emerge. For vocal register balance, the creators replaced the guardian angel Clarence with a female, Clara, and enhanced the part to make it the second lead. As a second class angel without wings, Clara is forced to don a hat while she oversees George. But she learns that when she lifts the hat, his world stops, and she’s able to express herself without competition. Heggie and Sheer also decided that when Clara grants George his wish that he had never been born, the music disappears. The hollow sound of only spoken words leaves a palpable void in the world until George realizes his mistake and sings his way back to life. Devices apart, It’s a Wonderful Life‘s dramatic power derives from its emotional shifts. From upbeat, as in the “Goodbye, Bedford Falls” and “Wedding Night” chorus and dance numbers, it turns sullen when George begrudges the weight he’s been asked to bear. Yet, charming and tender moments abound, as when Clara fakes drowning to save George (figure that out!) and when Mary surprisingly returns to George after rejecting Sam (who hogged the sled too much!). The music is accessible and listenable, with a particular nod to George and Mary’s love duet and George and Mr. Potter’s confrontation duet. But like most modern opera, none of the set pieces seem destined for “best of” compendiums. The leads are well suited to their characters. As George, William Burden reprises the role created at Houston Grand Opera, which co-commissioned the work along with Indiana University and San Francisco Opera. He sings confidently with full voice and carries the range of intense emotions well. Golda Schultz as Clara exudes magnetism and has a beautiful voice, but at times she seems a little underpowered for the hall. The remainder of the large cast, especially Andriana Chuchman as Mary, Rod Gilfry as Mr. Potter, and Catherine Cook as Mrs. Bailey, perform adeptly and provide fine support. All that said, It’s a Wonderful Life could present a challenge for audiences. Many opera aficionados may find the music too lightweight in sound for the opera house. At the other extreme, opera ingenues expecting the story detail and the close-up visual quality of the movie, but with hummable tunes added in, may find it a bit of a stretch – a little stilted and abstract. Hopefully, it will have legs, supported by those opera lovers who appreciate a fresh, non-dogmatic offering to the repertoire. It’s a Wonderful Life composed by Jake Heggie with libretto by Gene Scheer is produced by San Francisco Opera and plays at War Memorial Opera House, 301 Van Ness Ave., San Francisco, CA through December 9, 2018.